A wonderful art style and interesting setting cant make Traversers shallow puzzles and exasperating stealth sequences acceptable. What is it? A stealth puzzler set in an original dystopian world. In the underground cities of the last remnants of humanity, oxygen is king, and Raven Corporation is the dystopian mega-conglomerate that controls all the oxygen. Following Valerie, a young girl who’s inducted into the city secret police force, Traverser wants to be a puzzle game about fighting power and using ingenuity in lieu of strength. If only it had great design to back up this great premise. Valerie is a Traverser, a special agent armed with a gravity-field manipulating glove. Using the glove she can travel between areas and levitate small objects. And sometimes big objects? Traverser’s problems, unfortunately, are this basic and this deeply rooted within the logic of the world. The basic function of the glove is clear: walk into a room with a high ledge and a bunch of boxes. Use the glove to stack the boxes into a staircase, and use them to reach the ledge. Puzzle solved. But it’s never clear how or why or how much the gravity glove can lift. It can’t move or throw people or tables, but giant stones and an anvil levitate easily. The fact is that there are no rules; the glove levitates whatever the designer chose to make interactive. The lack of simulated systems makes Traverser disappointingly shallow. I never accidentally discovered that I could lift something unexpected, so I never found a unique solution to a formidable problem. There are no systems to play with, and nothing surprising ever happened to me. I solved every simple puzzle exactly as it was designed, instantly and effortlessly, and forgot about them. With the glove’s limited power, I’m also left to wonder: Why do I need a gravity glove at all? Eventually, Valerie gets tangled up with a rebellion against the totalitarian state, and the rebels justify sending a child to war by saying that she can go places and do things that they can’t, but... she's just lifting boxes and connecting pipes, carrying trash bags and pushing buttons. Find any adult who has ever moved out of an apartment and you will find them equally prepared for the fabled Traverser corps. Everything about Traverser feels half-baked and incomplete. Another example: at one point I got captured and thrown in prison. My first thought was "oh, this is the part where I get to solve problems without the gravity glove.” It would be interesting—a fun change of pace. Alas. They put me in prison and let me keep the gravity glove. I, a brand new inmate and dangerous traitor, am processed into jail with my super-rare gauntlet of power strapped to my arm, glowing as they lock the doors. I find myself nitpicking now, and it’s because I’m frustrated. I want to love this game. It’s beautifully animated and it’s got a strong, bold art style. The setting is a little bit steampunk, a little bit sci-fi, and wholly original. Valerie herself is a character I care about, and I want to explore her role as the Raven Corporation Gestapo’s littlest badass. Instead, I get this. Lifting keys and using crates to hit rats in the head. I’m so disappointed. 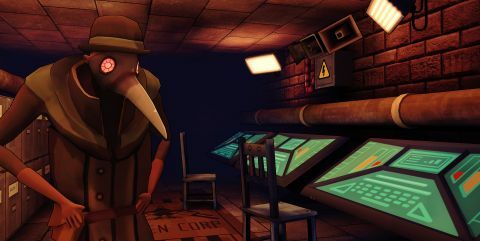 Solving puzzles with the gravity glove is only half the game, but the other half isn’t better: a limited set of poorly executed stealth mechanics. Holding a button to sneak past sleeping guards is functional enough, but I got spotted around corners and through doors often. The game’s fixed camera makes these sections worse; I was spotted by off-screen guards more than once. In good stealth games, getting caught can be part of the fun. In Mark of the Ninja or Splinter Cell, getting caught means it’s time to go loud, to salvage the situation somehow. There’s no way for Valerie to go loud. Guards give chase but thanks to the gravity glove’s mysterious limitations, I can’t kill guards. No matter how many times I slap them in the skull with a steel barrel or a wooden crate, they’re only stunned for a moment before they continue chasing me. The result: half of the game consists of insta-fail stealth missions with only a one-button “sneak” mechanic to play with. Great puzzle games put up barriers just strong enough to resist a first push. When that barrier eventually falls, players feel accomplished. I never got that feeling from Traverser. I was never stumped, and I never had to improvise and think in new ways. Traverser is a limp journey through a lovingly crafted, original setting that holds so much promise. A puzzle game that never challenges players is a disappointing thing. The undercity is a filthy, poor town for the lower classes. Propaganda and ads for Raven Corporation are clever and everywhere. I’m just going to throw this trash of the edge. We don’t recycle, right? Most of the first hour is spent in sewer pipes in the dark. Environmental puzzles show a real lack of innovation. The comedy of hiding from guards in a moving barrel wears off fast.